And it is done. The stadium hunt is over. As strange as that sounds, especially for unbelieving Marlin fans, this time it is true. Sure, we have heard this song and dance before but this time is different. Probably one of the most important days for the Florida Marlins franchise – and arguably one of the quietest – the Marlins have seen their proposal for a new stadium accepted by both the city of Miami and the Dade County panels. The stadium will seat about 37,000, feature a retractable roof and will cost about $515M for the project which is slated to open up in 2011. The deal also calls for the Marlins to commit to a 35 year agreement. The parking garage will have about 6,000 spots – most of which will be purchased by the Marlins each year and then sold (for a profit) each game in order to help generate revenue. 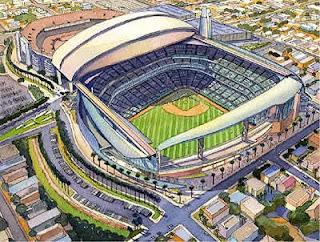 The new stadium will actually enable the Marlins franchise to create a more lucrative financial situation which could help stop the rotation of young players leaving south Florida to head off to other teams. Also, the Marlins will change their name from the Florida Marlins to the Miami Marlins since the city is funding most of the project.